On Saturday, September 22, 2018, at approximately 11:52 pm, a victim called Sheriff’s Dispatch and reported that two unknown suspects had taken his white 2014 Toyota Camry. The victim had been traveling through the town of Baker and stopped to rest near the Baker Country Store before two suspects assaulted him and used pepper spray to remove him from his vehicle forcibly. At approximately 00:44 am, an officer with the California Highway Patrol located the victim’s vehicle at the Chevron Gas Station near the incident location. The vehicle was being driven by Daniel Eduardo Ayala. Deputies from the Barstow Sheriff’s Station responded, and Ayala and a male juvenile suspect were detained without incident. 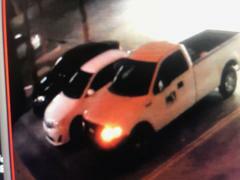 The suspects arrived to the area in a white 2008 Ford pickup truck. A records check determined this truck had been reported stolen on September 19, 2018, to the Los Angeles Police Department’s Newton Station. 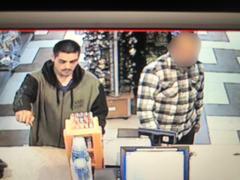 Through further investigation, our deputies learned that the suspects were involved in an armed robbery in Arcadia on September 19, 2018. Additional items, which had reported stolen during this incident, were recovered from the Ford truck. Ayala and the juvenile were arrested for carjacking and possession of a stolen vehicle and transported to the Barstow Jail and High Desert Juvenile Detention Center. Photographs of the white Ford truck and the suspects accompany this press release to determine if they have been involved in other crimes. Anyone with information regarding this incident or similar incidents is urged to contact the Barstow Sheriff’s Station at (760) 256-4838. Citizens wishing to remain anonymous may call the We-Tip Hotline at 1-800-78-CRIME (27463), or leave information on the We-Tip website at www.wetip.com.